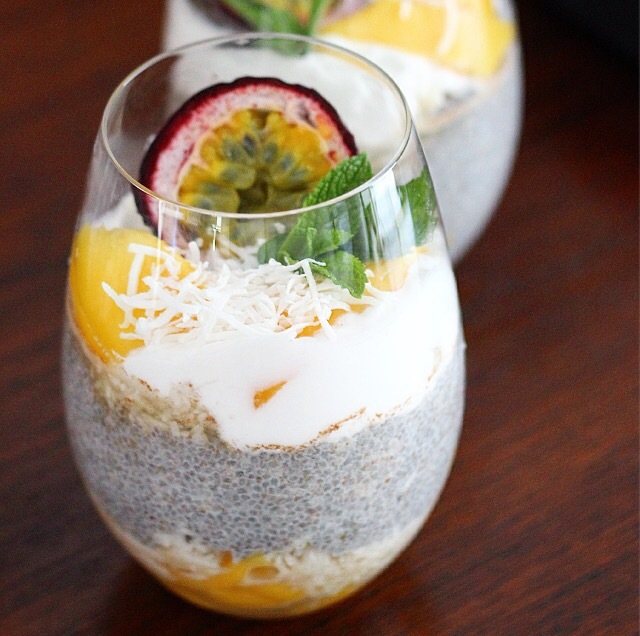 At the risk of jumping onto an overladen bandwagon, we are featuring a Chia pudding recipe. Without going into too much detail, Chia ticks lots of nutritional boxes. It’s versatility and ease of use make it a perfect ingredient for those of us who are forever running around with ‘headless-chook-syndrome’ and have limited time to address the demands of city living, including poor air quality, nutritionally void foods, stress etc etc. Of course, it’s not a magic bullet. For most of us, the main benefit of including chia in our diet is to increase interest, variety and the range of nutrients we’re exposed to. 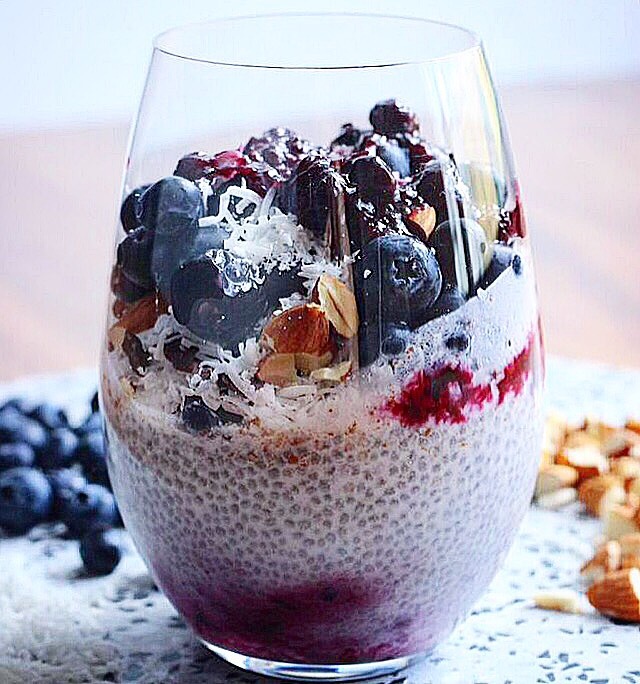 This is a simple chia pudding recipe that can be prepared a day or two in advance. Depending on season, you can add a range of fresh fruits or compotes to this recipe. Blended fruits and smoothies can also work well when combined in the chia mix. Toppings to include are crushed, toasted or raw nuts, shredded coconut, pepitas, puffed quinoa, and cocoa nibs work well for additional toppings on your chia pudding! ** Note: when choosing milks, avoid those which contain additives, enhancers etc etc. Read the labels carefully as some of these additives can nullify the benefits of this healthy breakfast recipe. In a large glass or jar, combine all the ingredients together, stirring thoroughly. Place into the fridge to set for a minimum of 1 hour. To make a quick blueberry compote, add the blueberries (set some aside for your topping) into a saucepan with the lemon and maple syrup and cook for 15-20 minutes on low heat. Once the blueberries have cooked and broken down, set aside to cool. The cooked blueberries can be placed in the base of the chia mix prior to refrigeration, or stirred through the pudding. Once set, top your pudding with shredded coconut, puffed quinoa, additional berries and a dollop of your blueberrry compote. Feel free to add your favourite yoghurt on top too! Place the coconut is a small bowl and add the lime and maple syrup. Set aside to soak for a few minutes. Place a spoonful into the base of your glass along with half of the sliced mango cheek. Top with the chia pudding mix and set in the fridge. Finish with additional spoonful of coconut, mango slices and coconut yoghurt.